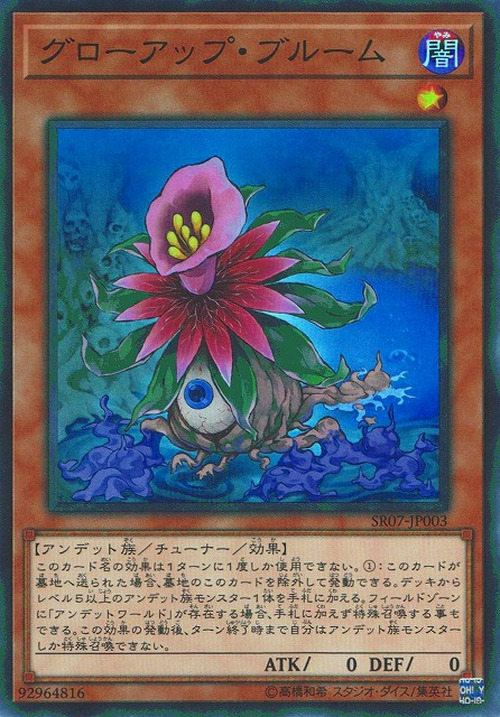 If this card is sent to the GY: You can banish this card from the GY; you cannot Special Summon monsters for the rest of this turn, except Zombie monsters, also add 1 Level 5 or higher Zombie monster from your Deck to your hand, or, if “Zombie World” is in a Field Zone, you can Special Summon 1 Level 5 or higher Zombie monster from your Deck, instead. You can only use this effect of "Glow-Up Bloom" once per turn. This card is the Zombie counterpart of Glow-Up Bulb. “Zombie World” appears in this card’s artwork.